@AnkerOfficial I thought when I saw the video that you have learned about US only giveaways. I mean doesn't matter. But when are you going to bring the plug to the European market? I still have the original MacBook Air. I can't believe how it's progressed since. For my new IPad Pro tablet I just purchased! The form factor is quite awesome. Waiting to see some reviews! Just updated to a LG V35, which can use PD (not ideal but still works just fine), so one of these would do great to replace my older macbook and G4 chargers into 1 system. I am gonna hold off until these are available before I buy new ones. I hope that this turns out to be compatible with more than just the the Mac books, and that products like the Lenovo ThinkPad X1 Carbon, etc, will be able to take advantage of these! This is only 27w, the lenovo carbon laptops require a minimum of 45w to work properly. You may get limited use from it, but unless they scale back its charging requirements this wouldn't work for it. brain fart, I thought we were talking about that 65w one they Anker has coming, with the new Macbook Air in its crosshairs. 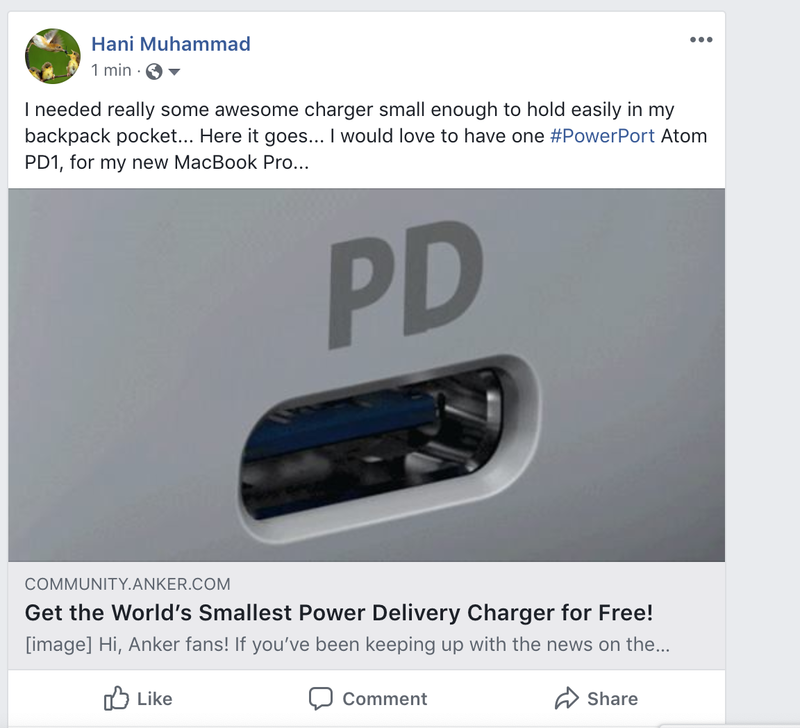 Look forward to using the PowerPort Atom PD 1, great going Anker! I love the tiny size would fit right in my tech kit that I dont go anywhere without. Then i could use an outlet anytime without the awkward moments or juggling other peoples cables so that I dont block more than one outlet. This would make it so easy to charge on the go without getting dirty looks from people. Its really great to see that the size of wall plugs is getting smaller/lighter (and the technology is getting better). This makes it really a lot easier to carry around. Hopefully we dont go like cellphones where we went from big cellphones to small/light portable ones and now we are back to big cell phones. haha. I would use the new wall charger to Charge my big USB-C wall charger. Once I get my new phone it will need USB-C to charge so it would be nice to have a charger that charges the same way. I'm about to upgrade my laptop and the one I'm looking can charge via USB-C so I could use it there as well.